Tourists in Thailand are being advised to "behave respectfully" and wear "sombre" clothing as the country mourns King Bhumibol Adulyadej. Thailand has entered a period of mourning lasting one year to mark the death of the 88-year-old king. King Bhumibol is revered in Thailand as a demigod, a humble father figure and an anchor of stability through decades of upheaval. The Royal Palace said Bhumibol died "in a peaceful state" at Siriraj Hospital in Bangkok, where he was being treated for various health problems during most of the past decade. The UK's Foreign and Commonwealth Office (FCO) updated its travel advice to urge tourists to "respect the feelings and sensitivities of the Thai people at this time". It continued: "Access to entertainment, including restaurants, bars, and shopping areas may be restricted and you should behave respectfully when in public areas. If possible, wear sombre and respectful clothing when in public. "Check local media regularly and follow the advice of the local authorities." A one-year mourning period and a 30-day moratorium on state events is now in place. Some bars will also be closed this weekend and those that are allowed to remain open will have to close at 1am, Thanakorn Kuptajit of the Thai Alcohol Beverage Business Association says. British singer Morrissey's concert in Bangkok has also been cancelled following the King's death, the Daily Mail reports. Local media reports Soi Cowboy, a redlight district in Bangkok popular with tourists, will be closed indefinitely. Around one million visits by British nationals are made to Thailand each year, according to the FCO. 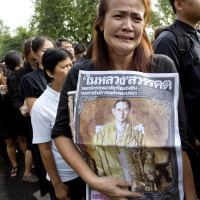 Hundreds of people gathered outside Siriraj Hospital, m any sobbing loudly and shouting "long live the king". He was a unifying figure in Thailand and the world's longest-reigning monarch. During a reign that spanned 70 years, the US-born Bhumibol became much more than Thailand's constitutional monarch. He was the nation's one constant as myriad governments rose and fell. A gentle leader, he used the influence of the throne to unify the nation and rally troops through the Cold War as Thailand's neighbours fell under communist control. His title has now been passed on to Queen Elizabeth II. Whether your destination is Thailand or elsewhere, holidaymakers are advised to take out travel insurance.